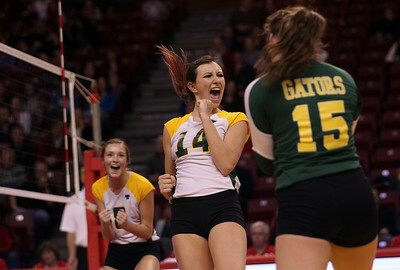 Sarah Nader - snader@shawmedia.com Crystal Lake South's Avalon Nero (center) celebrates a point during Friday's IHSA Class 4A semifinal against Benet at Illinois State University in Normal, IL November 15, 2013. Crystal Lake South lost, 0-2. Sarah Nader - snader@shawmedia.com Crystal Lake South players walk off the court after losing Friday's IHSA Class 4A semifinal against Benet at Illinois State University in Normal, IL November 15, 2013. Crystal Lake South lost, 0-2. 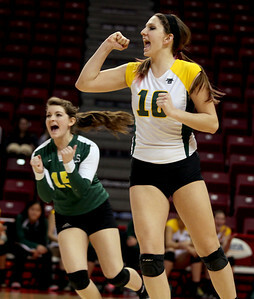 Sarah Nader - snader@shawmedia.com Crystal Lake South's Carly Nolan (right) celebrates a point during Friday's IHSA Class 4A semifinal against Benet at Illinois State University in Normal, IL November 15, 2013. Crystal Lake South lost, 0-2. 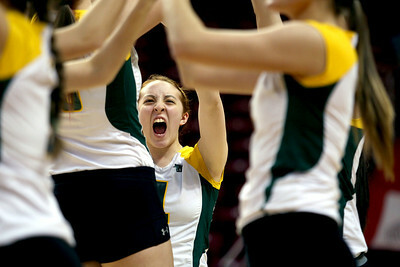 Sarah Nader - snader@shawmedia.com Crystal Lake South's Nicole Meyers celebrates a point during Friday's IHSA Class 4A semifinal against Benet at Illinois State University in Normal, IL November 15, 2013. Crystal Lake South lost, 0-2. Sarah Nader - snader@shawmedia.com Crystal Lake South's Tori Falbo returns the ball during Friday's IHSA Class 4A semifinal against Benet at Illinois State University in Normal, IL November 15, 2013. Crystal Lake South lost, 0-2. 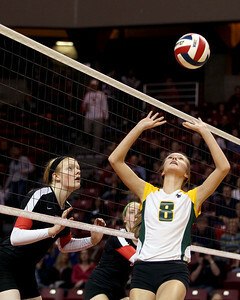 Sarah Nader - snader@shawmedia.com Crystal Lake South's Cassy Sivesind sets the ball during Friday's IHSA Class 4A semifinal against Benet at Illinois State University in Normal, IL November 15, 2013. Crystal Lake South lost, 0-2. 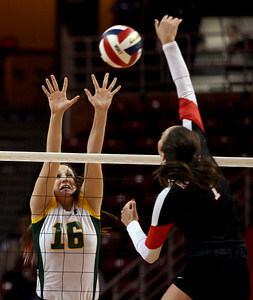 Sarah Nader - snader@shawmedia.com Crystal Lake South's Carly Nolan jumps to block the ball during Friday's IHSA Class 4A semifinal against Benet at Illinois State University in Normal, IL November 15, 2013. Crystal Lake South lost, 0-2. 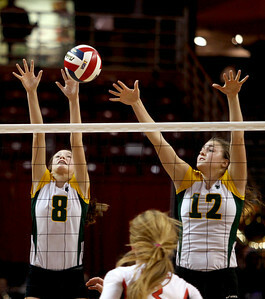 Sarah Nader - snader@shawmedia.com Crystal Lake South's Cassy Sivesind (left) and Nicole Slimko jump to block the ball during Friday's IHSA Class 4A semifinal against Benet at Illinois State University in Normal, IL November 15, 2013. Crystal Lake South lost, 0-2. 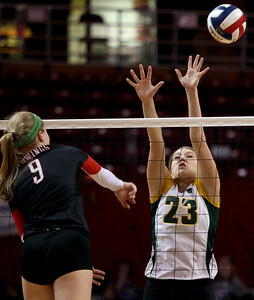 Sarah Nader - snader@shawmedia.com Crystal Lake South's Sara Mickow jumps to block the ball during Friday's IHSA Class 4A semifinal against Benet at Illinois State University in Normal, IL November 15, 2013. Crystal Lake South lost, 0-2. Sarah Nader - snader@shawmedia.com Benet's Caroline Wolf celebrates a win during Friday's IHSA Class 4A semifinal against Crystal Lake South at Illinois State University in Normal, IL November 15, 2013. 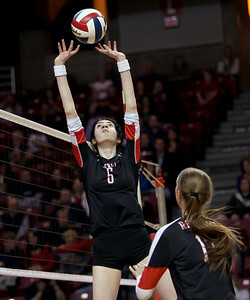 Benet won, 2-0. Sarah Nader - snader@shawmedia.com Benet's Stephanie Sinnappan sets the ball during Friday's IHSA Class 4A semifinal against Crystal Lake South at Illinois State University in Normal, IL November 15, 2013. 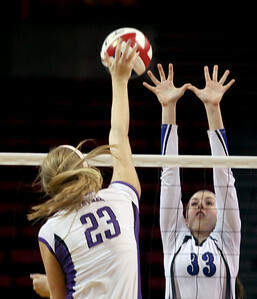 Benet won, 2-0. Sarah Nader - snader@shawmedia.com Benet's Kelly O'Malley returns the ball during Friday's IHSA Class 4A semifinal against Crystal Lake South at Illinois State University in Normal, IL November 15, 2013. 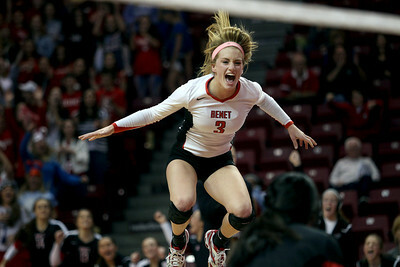 Benet won, 2-0. 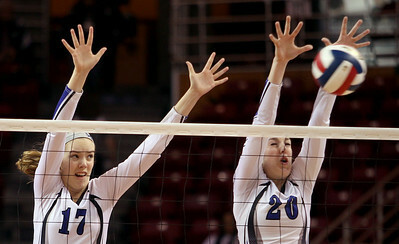 Sarah Nader - snader@shawmedia.com St. Francis' Mary Boken (left) and Kamryn Malloy block the ball during Friday's IHSA Class 3A state semifinals against Central at Illinois State University in Normal, IL Friday, November 15, 2013. St. Francis won, 2-0. Sarah Nader - snader@shawmedia.com St. Francis' Lisa Mordell celebrates after winning Friday's IHSA Class 3A state semifinals against Central at Illinois State University in Normal, IL Friday, November 15, 2013. St. Francis won, 2-0. Sarah Nader - snader@shawmedia.com St. Francis' Laney Malloy (left), Mary Boken and Daniele Messa celebrate after winning Friday's IHSA Class 3A state semifinals against Central at Illinois State University in Normal, IL Friday, November 15, 2013. St. Francis won, 2-0. Sarah Nader - snader@shawmedia.com St. Francis' Laney Malloy jumps to block the ball hit from Central's Madison Timmermann during Friday's IHSA Class 3A state semifinals at Illinois State University in Normal, IL Friday, November 15, 2013. St. Francis won, 2-0. Sarah Nader - snader@shawmedia.com St. Francis' Sam Dubiel returns the ball during Friday's IHSA Class 3A state semifinals against Central at Illinois State University in Normal, IL Friday, November 15, 2013. St. Francis won, 2-0. 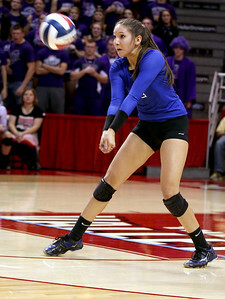 Sarah Nader - snader@shawmedia.com St. Francis' Daniel Messa sets the ball during Friday's IHSA Class 3A state semifinals against Central at Illinois State University in Normal, IL Friday, November 15, 2013. St. Francis won, 2-0. 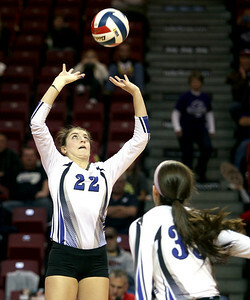 Sarah Nader - snader@shawmedia.com Central's Lydia Rehkemper taps the ball over during Friday's IHSA Class 3A state semifinals against St. Francis at Illinois State University in Normal, IL Friday, November 15, 2013. 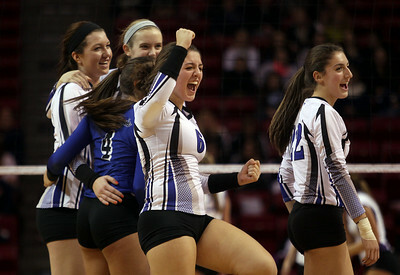 St. Francis won, 2-0. 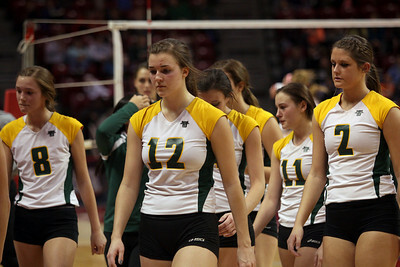 Crystal Lake South players walk off the court after losing Friday's IHSA Class 4A semifinal against Benet at Illinois State University in Normal, IL November 15, 2013. 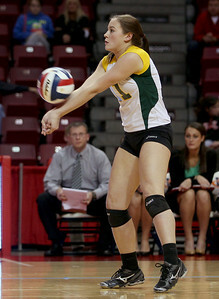 Crystal Lake South lost, 0-2.